Mick Newell was among the latest group of Nottinghamshire County Cricket Club employees to receive dementia awareness training. 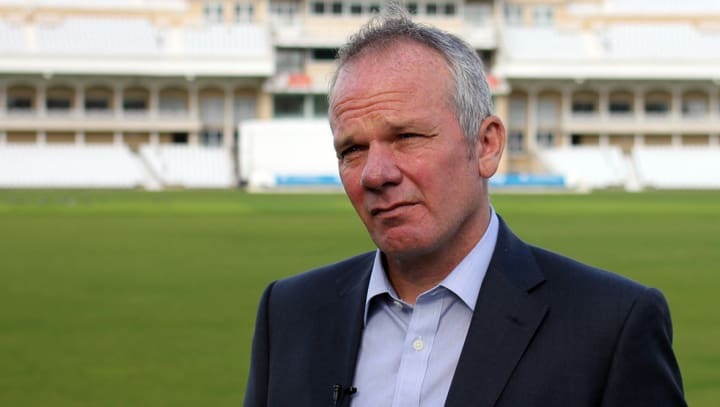 The Director of Cricket was joined by Chief Executive Lisa Pursehouse and other members of Trent Bridge staff as the Club commits to making the historic venue as welcoming and accessible as possible to people suffering from the condition. “We want to be welcoming for everybody that comes to our venue and I’d like to think that – as far as possible - suffering from dementia doesn’t have to be barrier to that,” said Newell. “We know sport can be powerful in terms of the memories it gives to people. So maybe coming down to Trent Bridge can help some people along the way. “To do that effectively, we need staff who are trained to offer the best possible welcome. “As a cricket department, we like our players and coaching staff to engage with our public too – so it was absolutely right that I was in attendance on this occasion, as it was for various others across the business. The Trent Bridge Community Trust, Nottinghamshire County Cricket Club’s official charity, have so far trained 108 individuals from across the organisation with stewards, volunteers and full-time staff among them. The training sessions, which are being delivered by JoCo Managing Director John Osborne, go hand-in-hand with the charity’s ‘Forget Me Notts’ community programme which takes place at the venue each month. “We bring together people who are suffering from dementia and their carers on a weekly basis at Trent Bridge and get them all involved in a range of activities,” said Community Projects Manager Mark Clifford. “It’s about using the special place our venue holds in the community to bring people together and offer some fun and togetherness for those who are affected by this cruel illness.